A market expert recently discussed some of the effects China’s National Sword policy has had on that country’s massive paper-products industry. China has been dependent upon imports of recovered paper. Overall, recovered material makes up 67 percent of the fiber used to make pulp, paper, tissue and packaging. Some 41 percent of that recovered fiber has come from imports. But that supply chain has been disrupted by China’s decision to severely limit imports of recovered material. “A prolonged disruption in the supply of this very valuable and important commodity would be very damaging to China’s paper industry,” said Tedd Powers, senior consultant on strategy at Fisher International, a market research firm, in a presentation last week. It could also place a large strain on global virgin pulp supply, he noted. 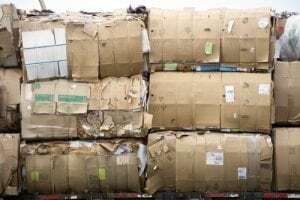 In 2016, Powers said, Chinese producers imported roughly 28.5 million metric tons of recovered fiber, and about 12 million tons of that material was “bleached recovered paper,” which he described as mixed paper, newsprint or sorted office papers. He acknowledged it isn’t a one-to-one comparison, because the yield of usable pulp from recovered fiber varies, so the producers were obtaining less than 12 million tons of usable pulp from that imported material. But even with a more conservative yield estimate of 50 percent, which would mean producers were generating 6 million tons of pulp from that material, replacing that volume would still require 10 percent of the world’s total supply of bleached market pulp. “That is a game changer,” Powers said. China’s major paper producers are particularly dependent on recovered paper. The five biggest companies, led by Nine Dragons, consume nearly a third of the total recovered fiber supply, which includes material generated in China and imported, according to Fisher International. So how are these companies faring during the massive market disruption? The major players have received a large portion of the import permits issued this year; for example, during the first round of permits issued this year, Nine Dragons received nearly half the volume approved for import. Still, there has been a substantial drop in imports of recovered fiber. Resource Recycling previously reported that during the first two months of 2018, China imported 2.51 million tons of recovered paper, compared with 4.67 million tons during the same period a year earlier. The drop in volume is having an impact. For instance, Lee & Man, one of China’s largest paper companies, announced last week that four of its recycled paper machines will take downtime next month. The company cited a shortage of recovered paper in its decision, fiber research firm RISI reported. And Nine Dragons this week announced it will acquire two U.S. virgin fiber mills, the company’s first investment in the U.S. fiber mill industry. The result has been decreased Chinese production, mills closing or companies burning through stockpiled feedstock. But the drop in demand and production is not necessarily bad news for producers, Powers said. He referenced earnings statements from the four largest publicly traded paper companies in China (Nine Dragons, Lee & Man, Shanying International and Long Chen Paper), all of whom have posted near-record revenues. He attributed the rising revenues to those companies’ ability to bring in recovered fiber, as well as the rising prices for the products they make, a result of less competition. It wasn’t only the contamination in imports that led the Chinese government to take action, Powers noted. He pointed to a World Bank estimate showing China will surpass the U.S. by 2025 as the world’s largest producer of municipal solid waste (MSW). China currently produces 190 million metric tons of MSW per year, the World Bank estimates. But by 2025, China will more than double its waste generation, producing 510 million metric tons per year, according to the estimate. That puts it far above the U.S., which at 256 million metric tons in 2025 is expected to be the second largest waste generator. “This is creating a big problem that China has to address,” Powers said.